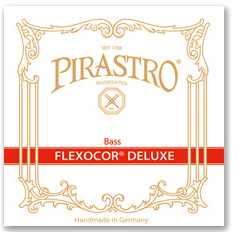 Pirastro (Germany) has some new upright bass strings just coming out. A lot of bass players that use both the Flexocor and Original Flexocors were both excited and maybe a bit uneasy: Yes, we always like something new and better. No, don't mess with our Original Flexocors! So while Pirastro still has the Originals and the regular Flex's, they came out with Flexocor Deluxe. (They could have called them Flexocor Delights!) Let me first say though, these are not Jazz strings, but people are already saying how much they like them on the pizzicato stuff as well. These new strings are going to be a huge seller for Pirastro. Everyone so far is loving these strings. Compared to the other strings that I mention, the Flexocor Deluxe strings are comparably more responsive than the regular Flexocors and even the Original Flexocors. I suspect that lately there is some new kind of element (alloy) that string companies (primarily Pirastro) has found to be a big asset in making powerful strings, and at the same time, very responsive ones. For as long as I can remember, there was too stark (no pun intended) contrast between strings that were real 'buttery' (ie. worked easily under the bow) and a really powerful sound that didn't sound harsh or that was hard to bow. When I say hard to bow, I mean getting the string to speak at the easiest touch or having a nice fat spiccato without sounding like a buzz saw. For so many years, it was virtually impossible to have that smooth buttery sound and at the same time, power. I wouldn't say that they are better, because that is a subjective issue and that is totally up to you, the player. Back to my Italian bass. I used to sit back and laugh at my cello brethren that would all mix their cello strings up: a Spirocore C, Evah Pirazzi G, Larsen D and Passione A! I would always use just one set of strings. All Flexocor or all Belcanto or whatever. It was definitely economically related because strings are so expensive that we are afraid to try new ones or goof around with mixing. If we don't like them...then what? This is why we have websites like this now to help players have a fighting chance. (Remember me saying at the top of this page, "these are not jazz strings"?) Just trying to help. This has been my (orchestra) set up for the past 2 years: Spirocore medium long E (for C extension), Permanent A, Passione medium D and G. The low C Spirocore (long E) has power and on my dark sounding bass and not too bright or scratchy with the bow. The Permanent is a nice cross bridge between the soft Passione D and the crispy Spirocore. Again (mantra).... every bass, every player... is different. The Deluxes are just as responsive as my Passione D and G and have more presence. Splitting hairs here really, but the Passiones might be a tad thinner gauge (maybe) and I feel that the G and D Passione might be a nano-bit more responsive (maybe), but the trade off here is that the Deluxes have power, and virtually the same response. On my bass... I will take that power. On another bass you might be so frustrated with the stiff way your G plays that you should take the Passione G and see if that will give you the response you are after. You can always take both the G Flexocor Deluxe AND the Passione Medium G and see which you like better. They are the cheapest strings in the set to try this. Life is short and I have two kids in college so I can we can use the money. Compared to the Belcantos, the Deluxes sound fatter to me. This is where it gets even harder to describe: I feel that the Deluxes are more open for spiccato type response and that I can push them a bit more than the Belcantos. The Belcantos though have that nice punch at the very beginning. I know, just when you thought I was going to say that the Deluxes are all around, better! I think that the new Flexocor Deluxe strings will give some stiff competition to the Belcantos for sure. Again, this depends on the bass. "I really like these new Flexocor Deluxe strings. I've been looking for strings which sound good on my Jakstadt bass, and these really fit the bill. I literally have been changing strings at least once a week--first Bel Canto, then Passione Stark, then Permanents. The Bel Cantos are too dark on my bass without much punch, the Passoine Stark really get a big sound, but I was getting wolf tones everywhere. Regular Passiones have too weak a sound, and Permanents are unbelievably harsh. These new Flexies have a beautiful tone, clean attacks (better than Bel Canto), and for the first time I can play across all 4 strings in Thumb position without the tight, wolfy, tubby sound that all the other strings had to varying degrees. The bottom end is full, and the attacks on the A string are far better than the Bel Canto A.
I'm getting used to the E extra long, a nice tone with no harshness. It could speak faster but I'm getting used to it and like the sound. Everyone has different tastes, different instruments, and will find what works best for them, but for me so far this is the prefect set of strings." That's a pretty nice endorsement! By the way, Bruce put these on his newer Al Jackstadt bass. I find Flexocor Deluxes to be an easy-to-play string that produces a clear and rich sound in all registers of the instrument. Their slightly lighter gauge is extremely responsive to the bow while still producing a powerful sound associated with higher tension strings. They are an excellent string that builds upon the traditions for which Pirastro is known while catering to the needs of the modern player. Again, there is never going to be any absolute when it comes to having the 'best' bass strings. There are too many variables involved: the individual requirements from the player, his or her bass, the styles and forms being played on etc... A long time ago, a bow dealer told me that "you almost need to find the bow that corrects or makes better the weakest part of your bass." Strings can be like this too. What you don't like or want better in your current bass, there is often some bass string that will make it better. 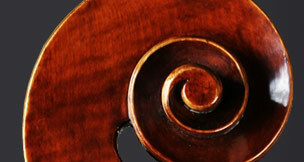 The Flexocor Deluxes are no doubt, great strings! No one that buys these is going to be disappointed. As my friend in the bass section likes to say, "what's not to like?"